The project will be broken down into three phases to handle 22,000 feet of pipeline, the common two-inch DuPont pipe material to be replaced with new piping from 4-6 inches in diameter. The added capacity will help prevent potential outages during big draws on natural gas, said PSE project manager John Guay, such as during lengthy cold snaps. It will also increase capacity as new residential construction comes online along Martin Luther King Jr. Way. 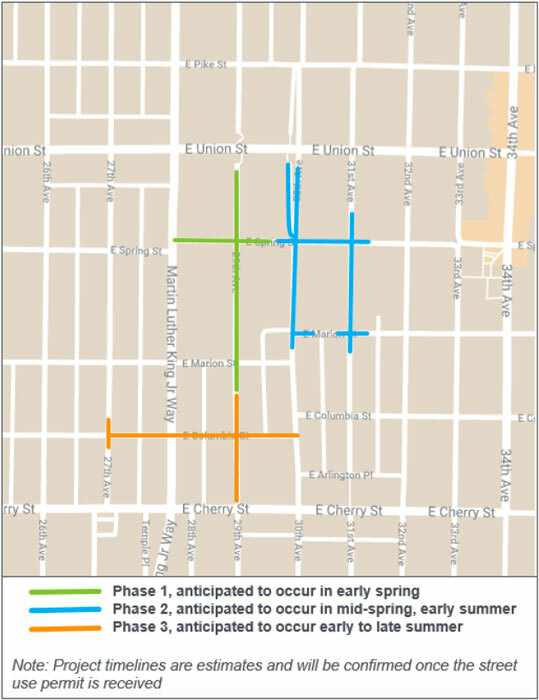 The first phase of work will focus on 29th Avenue, between East Union and Marion streets, as well as a portion of East Spring Street between MLK Jr. Way and 30th Avenue. The second phase is planned on 30th and 31st avenues, from East Union to East Marion streets, as well as East Spring and Marion between the avenues. The third phase, expected to start in late summer, will stretch from 27th Avenue to 30th Avenue along East Columbia Street and include a portion of 29th Avenue. Crews will trench portions of the streets to replace the service lines, and no road closures are planned, Guay said, though there will be traffic control flaggers and parking loss. Once the work is completed, the sections of road will be temporarily patched over and later restored under SDOT requirements. “We are restoring so many ADA ramps,” Guay said. The project manager said PSE is also working with an arborist toto avoid cutting any roots or trees. Work hours will be between 8 a.m. and 4 p.m. Monday-Friday.